Welcome…this blog was established to promote the legacy of National Dog Week and my book project, Every Dog has its Week: How Seven Days in September came to celebrate Dogs and the Humans who Love them. To learn more, please see ABOUT! NOTE: As the day of the pup-tials nears, Giorgio and “Lady B” are receiving so many nice wedding gifts…stay tuned for updates and a post about Ada Nieves’ plans for the big Pre-Westminster Show. To read a nice review of my own artwork, please go to http://www.brick.patch.com/articles/brick-woman-uses-art-to-make-memories-truly-timeless. A portion of my sales this weekend will go to a local animal shelter. http://www.cbaartshow.org. Erika Friedman and her staff are busy getting ready for another fun Canine Celebration event, a Doggy Wedding to be held on Saturday, February 12 at PetCo at 1280 Lexington Avenue, New York, New York from 1-3 pm… I wrote about Erika and her business in posts in the Archives dated September 25 and October 21. http://www.facebook.com/pages/canine-celebration…/153991841277982. The bride, Beignet, aka “Lady B,” is a Maltese from Clearwater, Florida, born on December 15, 2004; a Sagittarius, owned by Christina Ann Janssen. Beignet is a fashionista, and the inspiration for her mom’s business “Lady B. Couture”.~Clothing & Accessories for the “Well-Heeled” Canine! http://www.laboutiquebeignet.com/welcome/ Giorgio, who “belongs to” AuntChristine Pellicano, began his life as a puppy mill dog in a pet shop where no one wanted him because he was considered oversized for his breed. Giorgio, a Leo, turns 15 in July. As the Naked K9, Giorgio is the official greeter and head master of AuntChristine’s Little Dog House (a private bed and biscuit for Yorkies & Maltese) http://www.neighborhooddogs.com/ . He is passionate about his mission to help senior dogs in need. He even has his own website http://www.facebook.com/pages/The-Naked-K9/101351659919422 where he posts pets in need at NYC’s Animal Care & Control and the rescue groups that save these dogs. He uses this page to raise money for those rescue groups, including K9Kastle. Beignet & Giorgio met on Facebook last year where Giorgio asked “Lady B” to be his “friend” and included a note telling her how beautiful he thought she was. “Lady B” accepted his friendship and they have been posting on each other’s walls and reading each other’s status updates ever since. They finally met in person at Fashion Week 2010 where Beignet could not resist Giorgio’s fashion sense. 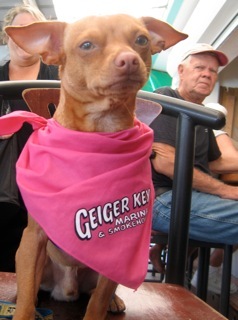 That evening Giorgio surprised her with a pink “diamond” Bling Bone engagement ring. As both are born under fire signs, this pairing is definitely muy caliente! The ceremony will be performed by NJ Wedding Planner, Celia Milton and the following Reception/Pawty will be hosted by MC Mike. You can also take a chance on some fantastic raffle items (see http://caninecelebration.com for details). Partnering with NYC Media, the official network of the City of New York, Erika has invited the stars of the new reality show Doggie Moms as guests. The show follows a group of New York City women whose lives revolve entirely around their dogs. http://www.animalalliancenyc.org. Children and dogs are welcome to attend but must be accompanied by an adult/owner. All proceeds from raffles are being donated to Mightmutts and Ollie’s Place, volunteer no-kill organizations dedicated to rescuing & rehabilitating the strays of New York City. They are a not-for-profit 501(c)(3) organization. All Contributions are tax deductible to the extent allowed by law. http://www.mightymutts.org. Good luck Erika and thanks for all your hard work on behalf of our beloved dogs! 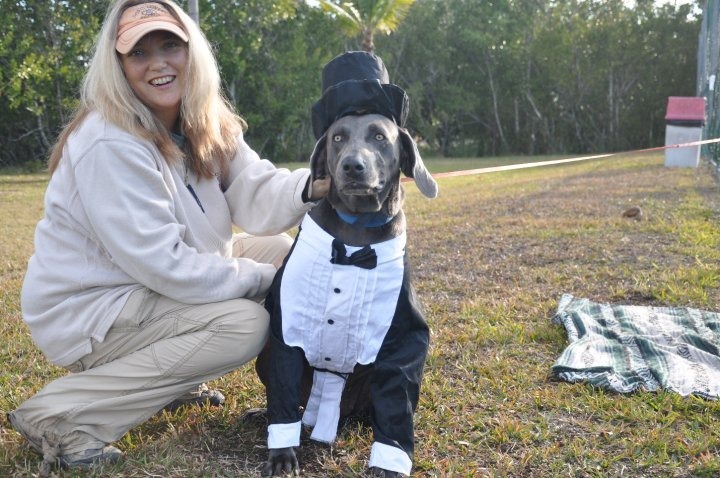 Plans for Big Pine Bark Park Proceed in Loving Memory of Co-founder, Amy Bressem…. Welcome to my Blog…established to promote the legacy of Will Judy’s enduring National Dog Week Movement and the intelligent exchange about the state of the dog in the states of the nation. To learn more, please see ABOUT. While we here are digging out from yet another snow storm, let’s turn our thoughts to “warmer” times ahead…Watch for posts about Ada Nieves’ Doggy Fashion Event, http://pre-westminsterfashionshow.com/ to be held on February 11th, and Erika Friedman’s puptials and party, a Valentine’s Wedding Event (http://www.caninecelebration.com) on February 12, when love will ocCUR or course…. Last March, while spending time down in Big Pine Key, Florida, I had the pleasure of meeting some dedicated dog-loving residents who were hard at work to achieve their dream of constructing an off-leash park for the dogs of the Lower Keys. Sounds easy enough, right? Wrong. These types of projects take persistence, patience, and permits to see them through. At one of the fundraising events held for the BPBP project, I met its co-founders, Michele Adams, Sandy Tuttle and Amy Bressem, three friends who joined forces to make life for local dogs, and their humans better. Sadly, in November, I received the news that Amy had passed, never to see her dream realized. To read my original post about the details of the planning of the Bark Park, you can go in the Archives of March 24, 2010. Because so many searches about Amy and the BPBP bring readers to this site, I asked Michele if she would like to give everyone an update on the progress of the park and in doing so, pay tribute to her good friend, Amy, and to inspire others to pursue the goals that are closest to their hearts, especially when they benefit so many. How is the Bark Park progressing? We have raised enough funds to begin the building of the park to install fencing, water line and signage. We are patiently waiting for Monroe County to issue the permits so we may order the fence. BPAA – Big Pine Athletic Association owns the land but Monroe County leases it so they had to have their attorneys make some changes in the verbiage of the property to allow dogs off leash and change the use of the land to be a dog park. Any day now! (hopefully). When is the park expected to open? I can’t really estimate any longer…in October I thought we would have had this done by the end of the year. At this point it is out of our hands and we are waiting – but putting pressure on those that can assist on a weekly basis. Once we have the permit it will take 3 weeks for the fencing materials to come in. During this time we need to install the water line and tear down existing fence that will not be utilized. How did your fund-raiser at the Parrotdise Bar and Grille held in December go? Great! It put us just over our 2010 goals; we raised $5,800 and have $22k in the bank itching to buy a fence! What is the last hurdle for the Park? PERMITS! Can you talk a little about Amy? Miss Amy — I met her about 4 years ago through another mutual friend. I was tired of having to drive to Key West to the dog park and asked my two friends if they would help me get one on Big Pine Key, so our dog park journey began in the Winter of 2008. She was integral to our media outlets and handled all of our advertising pieces. She was never one to miss fun! If there was something going on she liked to be there. 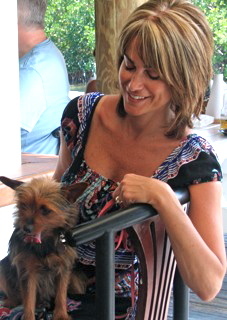 Amy Jennifer Bressem, 34, died Sunday, Nov. 21, in Key West, Fla.
Born May 30, 1976, to Joyce and the late Jon Bressem. She was raised in Feeding Hills, Mass., and graduated from Agawam High School. She earned a Bachelor of Arts from Brevard College, N.C. and later moved to Big Pine Key, Fla., where she worked as a graphic artist for the News Barometer and the Keynoter. She also freelanced photography. Amy died surrounded by family and friends she leaves to cherish her memory her loving companion Dustin Harrison, brother Andrew and sister-in-law Veronica Bressem; sister Kimberly Bressem and significant other Will Cluster; cats Fabio, Trixie, Dixie; dog Blue; several aunts, uncles and cousins; and many friends throughout the country. She had a passion for the sea and the sun, art and photography, playing softball and bocce, hiking, gardening, good music and good friends. Amy’s smile and laugh lit up the room wherever she went. She’ll be missed by everyone who knew and loved her. Welcome to my blog…established to encourage an intelligent exchange about the state of the dog in the states of the nation. To learn more, please see ABOUT. Each day, photos of hundreds of homeless pets desperately in need of rescue scroll across Facebook walls. Many Animal Shelters in America remain dangerously overcrowded and combined with scarcity of funds, the lives of these pets are at risk. Many dedicated animal-lovers throughout the nation commit time, energy and contribute their own money to help these dogs and cats that would most likely be euthanized without their intervention. With the help of these individuals, shelter pets are “pulled” from “high-kill” situations in one area of the nation and delivered to safe havens elsewhere for fostering or adoption. This is where Transporters come in. In this post, I talk to Cindy Adams, an Oklahoma-based Transporter who works as an Adoption Counselor for Second Chance Animal Sanctuary. What does a Transporter do? We pick up dogs or cats that are on a road trip. Some are coming from and going to various places……animal shelters, rescue groups, foster homes, & adoptive homes. How long have you been transporting? We have been transporting for a little over a year! Do you always work with your husband, Craig? Yes, because we usually have multiple dogs, so they extra person is very helpful. Can you tell us about a recent experience? We pulled a Great Pyrenees/Anatolian Shepherd mix from the Oklahoma City Animal Shelter for the rescue group Big Dogs Huge Paws. His front leg was broken in several places. We drove him from Oklahoma City, OK to Wichita, Kansas where he was going to a foster home after his leg was fixed. His leg was so damaged (broken in 5 separate places) that amputation was the only option. He is doing great & is still in his foster home until he is adopted. What would you like people to know about Transporting? It is so rewarding getting to help these wonderful animals. If you are a dog lover then I highly encourage you to get involved in transporting. Help is needed all over the United States. How can people become involved? I started by contacting two groups, Above and Beyond Transport Team and OTRA (On the Road Again) http://groups.yahoo.com/group/ontheroadagain/. (OTRA is a volunteer animal transport group dedicated to aiding rescue animals by moving them to their forever/fosters homes by combining over-the-road truck drivers, pilot cars and personal vehicle transporters for quicker and more efficient transport). What area of the nation do you see as having the most problems with unwanted dogs? Why? The southern region of the United States. For the most part, pet owners of this region do not spay and neuter their animals and until people stop having the attitude that animals are disposable and not a serious lifelong commitment the problem will not get any better. This country needs more responsible pet owners. What can people do to assist you, and your colleagues, in your work? If people can’t transport they can make donations. Of course money is always appreciated but purchased items such as dog food, blankets, beds, toys; treats, collars, leashes, etc are always needed by local rescue groups or humane societies & shelters! They can also adopt dogs & encourage friends & family to adopt instead of “buying” from a breeder. I just think people don’t realize that there are many purebred dogs being killed every day in shelters (and wish) breeders were not their first option. Spaying & neutering is also very important! Any prevention of unwanted animals is always good, plus it is better for the animal too! In 1928, Captain William Lewis Judy, established the National Dog Week Movement, not to bring more dogs into the world, but to make us better guardians to the ones that are already here. These spepcial seven days, observed the last week in September, highlight this goal and encourage awareness throughout the entire year. Transporters like Cindy Adams look forward to a time when this goal is truly reached, and all homeless pets can be placed in good homes for the duration of their lives. Thank you Cindy and your fellow volunteers who tirelessly fight the good fight each and every day on the behalf of the nation’s pets. Meet Rich Bel and his Celebrity-Centered Pet-friendly Site, PETtell! Welcome to the Blog about National Dog Week. To learn more, please see ABOUT. Thanks again to Frank Simonelli, for sharing his personal story as a Pet Communicator in the previous post. Congratulations to Seattle-based author Steve Duno. His book Last Dog on the Hill: The Extrordinary Life of Lou is in its Third Printing and will be available in paperback in late Spring. (To read more about Steve and his writing see Archives/September 21). Upcoming posts will feature an interview with New Jersey Dog Whisperer Janice Wolfe and some exciting developments over at Merlin’s Kids (see Archives/ September 14) as well as a profie of Oklahoma-based dog rescuer and “Transporter” Cindy Adams. From time-to-time I post about other pet-centric Internet sites and blogs. There are so many good ones out there and I hope to share more with you this year. Last year, I wrote about Josh Abrams and his highly social pet networking site, http://www.dogasaur.com and later, Gretchen Kruysman’s http://www.fetchdog.com site that provides information on unique pet products and dog-related items. This post, presents Rich Bel, a hard-working pet blogger and director of his own celebrity-centered web site. A recent visit to his site had me reading items about the dating habits of Lindsay Lohan, the potential earnings of Jon Bon Jovi, Will Smith, Lady Gaga, cast members of The Jersey Shore, and my personal fave, Bocker the Labradoodle (my dog Hooper’s heartthrob)! There are also Link Exchanges for other pet-related sites and Blogs. Rich likes to say that he resides on the Internet, and I believe this is true because he is a tireless, nonstop blogger, dedicated to his 3,500 plus Fans over on Facebook, and beyond! Here, Rich shares his goals and ambitions for PETtell. Why a blog about celebrities? While blogging, I was frustrated with all of the negative celebrity gossip sites. So, I started blogging about celebrities. Positive posts only! Within the first week, someone had commented on my blog. Now my Blog is about pets and celebrities (with emphasis on celebrities due to the fact people are not posting pics of THEIR pet). What is its goal or focus? What makes your blog different from other blogs? My blog goal is to combine celebrities and pets on one blog. It is the first blog to do this, to my knowledge… I want people to be able to come to a blog about pets and celebrities where there are no negative posts! Likewise, I have created several interactive categories where I ask my audience their opinion. “Who do you think [this celebrity] should date?” “Put a title on this” “Caption this.” I have also created quizzes and polls. In short, eventually, I would like to be the most commented blog ever. In short, I want to make my audience smile and bring some happiness when they come to my blog. And, I would love to interview Leonardo Dicaprio because I have been a fan of his since I was a teenager and he picks such a wide-range of characters to play. Plus, I heard, DiCaprio HARDLY gives interviews – Hence, it would be very special. I know Dicaprio just bought a turtle within the last couple of months because the blog of sphere went nutz about the story. A person has reached the “A list” when everyone blogs about the choice of his pet. What pet-related issues are you passionate about? My passion is to create a community for pet owners, where owners can enjoy being with each other and bring as much happiness to their pet as their pet brings to them… I had two wonderful dogs growing up who were a critical aspect of my childhood and consequently, my life. Thanks Rich. We wish you great success on all your endeavors…if you know a dramatic Dalmatian, a hammy hound, a stage struck shepherd or a Broadway-bound Bichon or if you’re Brad Pitt, or even Brad Pitt Bull, send Rich a picture or let him know about your event or news! Keep posted for my interview with celeb-pet blogger Rich Bel and an update on New Jersey “Lady Dog Whisperer” Janice Wolfe as she talks about her AKC Ace award-winning dog Wyatt and their recent trip to Hollywood and soon to be opened Merlin’s Kids Ranch designed with the guidance of Temple Grandin! The same day I read Jennie’s post, another Facebook friend, Deanna Vicera approached me about writing a post about a local Pet Communicator, Frank Simonelli, resulting in the following interview…. How does a Pet Communicator work? There are different types of pet communicators. They train dogs in various ways. For instance, in military use, dogs can be trained to detect bombs, drugs, even to track down humans. There are Seeing Eye dogs and Search and Rescue dogs. Here, trainers are communicating and teaching animals to use their natural abilities to perform highly skilled tasks. There are communicators who work with behavioral problems such as house training, barking and aggressive behaviors. What I do is a little different. First, I am a Medical Intuitive, a Medium, and an Empath. I can feel an animal’s pain, his sorrow, fears, love and anger, all of its emotions. In understanding or communicating with the animal, I can convey to its caregiver what the animal’s needs are. Once a caregiver understands what’s happening with an animal, the appropriate measures can be taken to help it. Do you just work with dogs? On the contrary, animals allow me to work with them, but no, I devote most of my time understanding and interpreting the information that comes to me. Humans require more of my time than the animals do, however, I feel privileged to be able to help any living creature at all. Animals are easier to work with in some ways. They are humble, their minds are uncluttered and they are unaffected by societal pressures and influences, but that is another subject. When did you become aware of your ability? Can you relate how your ability helped a pet owner? I have been aware of my spirituality all of my life. My earliest memories go back to infancy. As a child, I tried to keep it to myself, but somehow I believed that it was very obvious that something was just “Different.” I learned to live with it secretly. I wanted desperately to be like everyone else, how foolish! I always had a deep connection to animals; however, it was not until 1998 that I would discover that I would understand the words that the animals “didn’t” say. One summer afternoon I stopped by my sister-in-law’s home to visit. She had a wonderful little black poodle named Ebony. Ebony and I were buddies, in fact, that was my nickname for him. Whenever I came to visit, I would call him from outside the house calling, “Buddy, Buddy, Buddy” very quickly. My sister-in-law would open the door and Ebony would run out to greet me with great enthusiasm. For years we did this. On this August day in 1998, when I called out for my Buddy, my sister-in-law opened the door, and Ebony ran out to me without the typical enthusiasm. I picked him up and headed inside the house to seek shelter from the heat. I sat on the couch in the living room with Ebony on my lap, at this point I was not even aware that his behavior had even changed. It was about 100 degrees outside, we were experiencing a heat wave and I was happy to be sitting in a cool air-conditioned room. I recall my sister-in-law serving me a cold drink. That’s when the “The tap on the shoulder” came. That is my reference to my ability; a spirit is letting me know that it’s time to work. Ebony was panting and lethargic as he lay across my lap. I placed my hand on him; he turned slowly and looked up at me and I felt his emotions. Just then I felt pain, real sharp pain! I asked my sister-in-law if she knew what was wrong with him. She told me that she thought he may have burned his front pad on the scorching pavement outside while chasing a squirrel and that he might be over heated from that earlier chase. However, I knew better. I began to scan the dog with my hands as I would a human in a Medical/Healing session; from his head and neck, down his back, to the left and right sides. Once again, while connecting with the dog, I asked in my thoughts, “Where does it hurt?” I checked his front pads, nothing/clear. Then I felt a sharp pain shoot down my right leg. I almost couldn’t sit still in the chair any longer. I placed my hand on Ebony’s right rear leg and my hand felt overwhelming heat and pain which went right through me. I called to my sister-in-law, “You need to get this dog to the vet as soon as possible!” With a laugh, she asked why, as if I was overreacting. It’s not his paws,” I tried to explain. “Ebony has a torn ligament in his right rear leg. He is in so much distress that he could die, that’s what animals do.” She laughed at me; noting that my psychic crap was so ridiculous and that there was nothing wrong with her dog. I realized there was nothing more I could do for him. My message had not been well-received. That night my sister-in-law realized that Ebony’s behavior was significantly different. Maybe I should take him to the vet, she began to think. The following morning she made an appointment. She explained to him what she believed to be wrong with her dog, and told the vet about her crazy brother-in-law who thinks he’s psychic and continued to tell him of my experience with Ebony. The veterinarian was not amused by the joking manner in which she told the story, instead, he seemed interested in what I had to say and did extensive testing. After many hours, the vet’s findings were as follows: No burnt pads, no dehydration, however, a serious injury to his right rear leg had been detected, specifically a torn ligament. The dog was in great distress, enough pain to cause him to expire. Ebony eventually healed, but my sister-in-law did not! It was “Too Freaky” for her and she never mentioned the experience again. This was the first time I was aware animals could communicate with me. How do people react when you tell them about your abilities? For most of my life I told no one of my extraordinary abilities. Somehow it was obvious something separated me from everyone else. I didn’t want to be isolated, however, to some degree I was. I had too many unusual questions about life and my existence here and not enough about baseball and football. I became intrigued with mechanical things like clocks, motors, electricity and science. I started drawing things that I dreamed of. The other kids thought I was weird, and I was, kind of. I wanted tounderstand time, why we got old and died, and what came next. Did we go to the place where our dreams came from? These are not normal thoughts for a six-year old. I felt that I burdened others with my presence but some people recognized something else in me. I always smiled, I was always respectful. In my first year of High School an art teacher developed an interest in my drawings and he recognized a connection between the art and my natural spirituality. He speculated that the drawings came from visions. As a result of his continued effort, I was offered a scholarship to Pratt institute, a very prestigious art school in New York City. This was the first time I felt accepted and the first time I was okay with myself as it related to my spiritual abilities. As to peoples’ reaction to me, well, as I got older it got better. Just like anyone who survives the turmoil of indifference during their youth, there are many of us who are different in many ways and we struggle for a common social acceptance. As a survivor, today I find myself very comfortable with who I am. I find my extraordinary abilities to be a blessing instead of a hindrance to my existence. I offer my help continuously to the very lost souls that I struggled to be like or even hid from. It is amazing to me that the normal, the conformists, need the most help understanding their own existences and they are usually afraid to ask. Most people, who know me, find my journey through life interesting to say the least. In general, perhaps, as a result of our difficult times, they are now searching for answers themselves, thus making my abilities and philosophy’s a little more acceptable. How can pet owners develop their own innate abilities, or can they? How do you sharpen your own skills? We become thoroughly connected mentally and spiritually to animals as do they to us. The word love need not be spoken; it is the simplest form of communication and the first to be recognized by an animal. When a dog is taken from its mother at eight weeks old and it finds itself nose to nose with you in its new home; it doesn’t take long for the animal to know that you love it. You can sense this very quickly as the animal begins to look for you. It wants to play with you, it follows you, it sits by you, and it will fall asleep with you. And guess what, you have communicated with an animal, too. They say there are two sides to a person, the animal side and the spiritual side. I believe there are three parts. Two that coexist but act as one that is the spiritual and animal sides. Then there is the societal impact which in most cases defies nature. To be in your animal is to say you’re free from the societal, humanistic ways. To be in your animal is to only rely on your instincts. Once you begin to rely on your instincts, you have also opened the channel to your spirituality. These two powerful forces combine their elements and begin to work together. That’s when you begin to hear the animals. You can develop this ability but first you must be able to find the center of your own soul, truly a difficult task! Think about the deepest love you know, focus on that for a while, for that very love comes from where the center is and that’s where the love and understanding of the animals comes from in the first place. Through your love, you more than likely communicate more than 100 words with your pet everyday without speaking. As a spiritualist my awareness is a great deal more acute. When I work with animals I often get the whole story. They love to be heard, always honest and are always grateful. Have you ever communicated with a dog that has been involved with Dog Fighting? I was recently contacted by a highly reputable animal activist, a true caregiver. 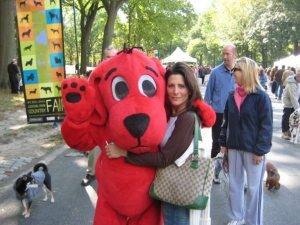 Her name is Deanna Vicera, a professional Dog Groomer and owner of Doggie Stylin’, a mobile grooming service in central New Jersey. She is unrelenting in her work with animals which spans many areas. She is involved in rescue work, adoptions, locating missing dogs, grooming and hygiene, etc. Her tireless efforts are extraordinary and highly commendable. She is loved and respected not only by the owners of the animals she grooms, but the animals themselves. Deanna and I are currently working on “The Polly Case. Polly is a two-year old Brindle Boxer abducted from a parked car in the Freehold, NJ Shoprite Liquors Parking lot on Route 9 on November 23, 2010. I visited the abduction site with Polly’s caregiver, (Mom), along with Deanna and later did an intuitive reading. The reading showed great details about “Bait” dogs, gambling and vicious dog slaughters in a highly corrupt and organized manner. The vision indicated sponsorship by very wealthy people and highly disturbing details emerged from this reading. Back in 1949, Will Judy, Founder of National Dog Week wrote that the only thing separating dog from man was a thumb, and an “alfabet.” Thank you Frank, for sharing your special life-story with everyone and thanks also to Deanna and Jennie for their contributions. I am sure there are skeptics out there, but I encourage everyone to give all your options a chance and keep an open-mind, especially if a pet’s life may depend on it. Healing thoughts and prayers for Polly and Hardee and all the other animals in need of our help. Sadly, Frank does not get a good feeling about Polly’s fate. Please do not leave your dogs or other pets unattended outside, or in the car when you are running errands… There are many who wish to do them harm, unfortunately….